Video - Visit VN TV! 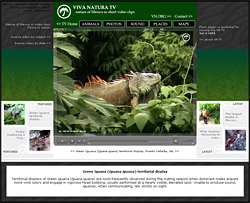 VN TV - Our new project and the first effort ever to publish on web thematic video - clips and short documents in form of video focused exclusively on Mexican nature. This VN section presents short video clips in SWF form. By clicking the proceed button, the movie will start downloading. Please note the file size - high speed connections recommended.